The video featured in this article demonstrates the function and design of a powerful form of air cannon that operates using a purpose made valve that opens very rapidly. This allows for a massive amount of pressurized air to be released at once to throw a projectile many hundreds of yards. The design of the cannon also allows the barrel and the air chamber to occupy the same space, and so it is very compact and manageable which makes for an enjoyable shooting experience. To understand how the valve I use in this cannon works, examine the third animation on this post over at SpudFiles. I also go into more detail of how these cannons function in a video I made many years ago, showing how to build a smaller version using these same principles. 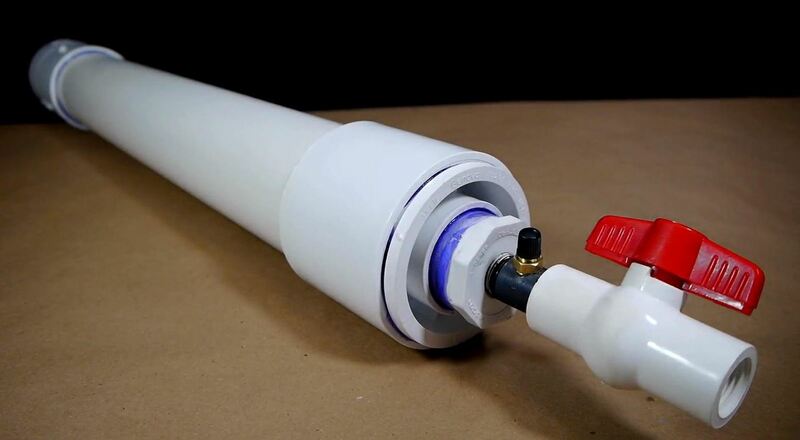 It is specifically against manufacturer recommendations to use PVC to contain pressurized air. This video is solely for education and entertainment purposes. Can you explain more about where to get the 3inch to 2 inch reducer? The one you use is not a standard design, most reducers dont allow for the two pipes to fit one inside of the other. Sorry for the delay, glad you found it! how potato will lift ? when piston is 3 inch &potato is 2 inch.in that case piston will not touch the potato.also air will not pass across piston ? Does anybody know the final cost of this design?